Mount Etna. The highest volcano on the European continent—and almost constantly in a state of activity—dwarfs all around it; its fertile volcanic soil cultivates the fine vineyards, farms and orchards draped about its slopes. On June 21, 2013, Etna was included in the UNESCO World Heritage list. Now, to celebrate the second anniversary of this event, you can now explore the beast the locals know ominously as "a muntagna" (“the mountain”) on Street View in Google Maps. On our way to the summit, we took imagery of the darkened slopes of the Crater Silvestri, about 2,000 meters above sea level (see below); and after another challenging climb—carrying our equipment above 3,000 meters—we managed to capture breathtaking views from the top of the Crater Silvani. This stunning imagery not only enables anyone with an Internet connection to walk the beautiful trails of the mountain—it’s also a way to protect and enhance the cultural and historical heritage of the Sicilian territory and its beauty. Precisely for this purpose, the Google Cultural Institute has partnered with Unioncamere and the Chamber of Commerce of Catania who built an exhibition where you can discover the unique history of Mount Etna and the art and culture of its surroundings—in particular, how the Etna basalt, formed by the slow solidification of the volcanic lava flows as they cool, shaped the architectural heritage of this region. And if you’re passionate about volcanic landscapes, Google Maps spoils you: you can visit the volcanoes of the National Park in Hawaii; Crater Lake National Park in Oregon; the Meteor Crater in Arizona; Japan’s Aso volcano; and you can even walk the Nishiyama Crater Promenade. 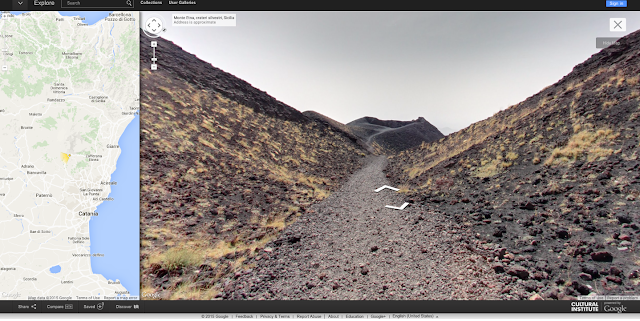 We hope these fascinating images entice you to visit Sicily yourself someday—but for now, enjoy your virtual trip up one of the most beautiful volcanoes in the world with Street View. Nestled between Messina and Catania in the North East of Sicily sits one of the most active volcanos in the world: Mount Etna. The highest volcano on the European continent—and almost constantly in a state of activity—dwarfs all around it; its fertile volcanic soil cultivates the fine vineyards, farms and orchards draped about its slopes.